This review was previously posted on the Australian Romance Readers Association blog. 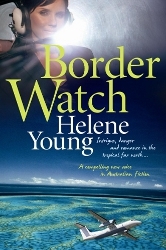 The first in a trilogy based on Australia’s aviation industry, Border Watch by Helene Young is the story of Captain Morgan Pentland, who has overcome a childhood of violence to become a border patrol pilot, and Commander Rafe Daniels, a former SAS officer who suspects Morgan of leaking information to terrorists. Sparks flew between Morgan and Rafe from the moment they met and when Rafe joins Morgan’s team, they share a combative banter, unwilling to admit to their attraction. A terrorist attack brings them closer and they develop a mutual admiration and respect for the other’s strength, but remain unwilling to get involved. The inquiry that brought Rafe and Morgan into proximity again also keeps them apart as Rafe is forced to maintain the integrity of his investigation by keeping secrets from Morgan. She holds him at arm’s length because she’s been burned before and thinks that being strong means not letting anyone in. More a suspense with romantic elements, Border Watch isn’t a traditional romance novel; with national security at stake, the romance has to become a more subtle aspect of the story. However Young makes sure to give Morgan and Rafe a happy ending that does her characters justice. The title refers not only to guarding the Australian coastline, but also the walls that Rafe and Morgan have built around themselves and, after the resolution of Rafe’s investigation, Young finally allows Rafe the space to deal with his survivor’s guilt and Morgan with her trust issues and her need to be strong before they can become a couple. Morgan is a very likable heroine as the victim who refuses to give in. Her care and compassion make her a good match for Rafe, whose need to serve and ability to rise above himself is mirrored in Morgan. Both characters have a few flaws but they only make them more interesting and realistic. Border Watch is a very Australian book. The language is Australian, the issues and politics are Australian and the landscape is almost a character in its own right. Young did an amazing job of bringing the tropical north to life from the beautiful views and wildlife to the unrelenting heat. I was pulled into her world and would like to see Border Watch be made available to the international market so they can see there’s more to us than kangaroos and koalas. The writing was both intelligent and down to earth without being boring. The terrorist threat and security protocol were expertly handled, all the way down to the interagency stuff-ups. If you’re looking for a book to refresh your romantic palate without completely departing from the genre, give Border Watch a read. 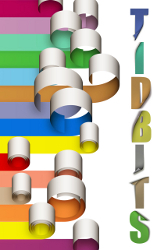 A review copy of this book was provided by the author. 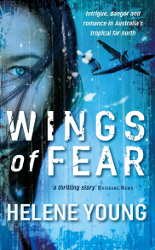 It has since been reissued under the title Wings of Fear. 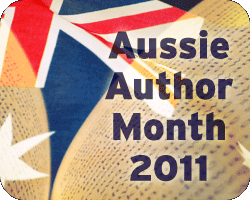 Tagged aussie author month, australian authors, australian characters, australian romance, helene young.